Statistics wouldn’t be what it is today without Johann Carl Friedrich Gauss, a German scientist. He was born April 30, 1777, in Braunschweig and died Feb. 21, 1855, in Göttingen. Born as the only son of a poor worker’s family with illiterate parents, he was a child prodigy. Luckily, teachers, professors and even the Duke of Braunschweig recognized his potential and supported him early on. Mathematical historian G. Waldo Dunnington names his bibliography Carl Friedrich Gauss: Titan of Science, and that is for sure: Gauss holds an eternal place in the Olympus of natural sciences. Today, as part of celebrating the International Year of Statistics, we honor Gauss. While at primary school, he reportedly invented the “Little Gauss Formula,” when the teacher gave the class the task to sum up all the numbers from 1 to 100 as punishment. Gauss recognized that he could build 50 pairs of numbers that sum up to 101 like 100+1, 99+2,… So, after few minutes, he had calculated the answer: 5,050. Although it is unknown whether this really happened, I am absolutely envious that as a child he saw this simple solution that I had never thought of even as a university student. The number and range of scientific areas he contributed to are very impressive. In addition to mathematics, he did research in geodesy, geophysics, electrostatics, astronomy and optics. Between 1818 and 1826, he managed a geodesic survey of the Kingdom of Hannover. As an aid to long-distance measurements, he invented the Heliotrope, and applying his theory for the solution of numerous linear equation systems, he drove it to a precision that was never seen before. What on Earth is Normal? Several of his theorems have been indispensable to the field of statistics. Numerical approximations – widely used in computer programs – use his Law of Error Propagation. How would we find a regression line without his Least Squares method? But the most fascinating development for me is the normal density function. This function is defined over the whole range of real numbers from infinity to +infinity, yet the area under the curve always equals one. The shape can be varied using only one parameter, and no matter how it is set, the area under the curve remains the same. The formula itself is of a surprising simplicity, given the universality of its use. And on top of that, it is the distribution of sums of randomly varying distributions, if only the number of observations is large enough. Gauss himself applied these theories practically in his successful administration of the foundation for widows and orphans at Göttingen University. Gauss was a hard worker and a perfectionist. He refused to publish theorems that he hadn’t the perfect proof for. Others he didn’t publish because he feared attracting the controversy that arose when he proved commonly accepted theorems wrong. But he was a passionate diary writer, so significant parts of his work were published after his death, when his diaries were found in 1898. Mathematical historian Eric Temple Bell states that if Gauss had published all his ideas by himself in a timely manner, he would have advanced the development of mathematics by more than 50 years. Perhaps our modern scientific community should not only learn from his theories but from his motto as well: “Pauca sed matura” (few but ripe). Here’s my personal Gauss anecdote: When I introduce myself as a statistician, people often say something like, “Oh, it must be uninspiring and boring and theoretical and….” While the German Mark (DM) was still in use, the 10 DM note was devoted to Carl Friedrich Gauss. On one side, the note featured his portrait and the normal density curve; the flip side of the note showed a heliotrope and a sketch of the triangulation of the Hannover kingdom. So back in those days when we used the DM, I could ask people to show me a 10 DM note and voilà! Instantly, I could show them that statistics really is part of everybody’s real-life transactions and life. 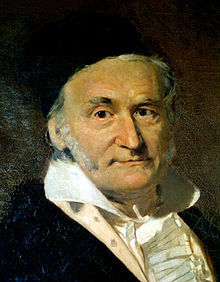 If you are now curious about Gauss, his research and his life, you will find a lot of information in Wikipedia. Take a look at the German Wikipedia site too; it has many more links to further reading. I recommend Daniel Kehlmann’s book Measuring the World (Die Vermessung der Welt) that describes the life and the findings of Gauss, and contrasts it with the excursions and adventures of Alexander von Humboldt. It is a fascinating book about two eccentric scientists who extended our understanding of the world at the same time but in completely different ways. Of course, his home town Göttingen celebrates her famous son. There is a scientific Gauss-community in Germany, and probably more around the world. Gauss was one of the great geniuses of the last thousand years. His life and work inspires in a way that has no modern parallel. Vielen Dank for honoring him here.